What is better than coming together in the community, eating great food for a great cause. Here are a few upcoming charitable events which celebrate food! 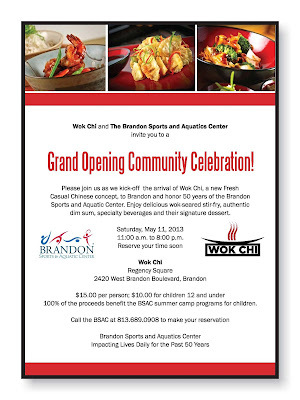 May 11th - Grand Opening Community Celebration at Wok Chi. Enjoy wok-seared stir fry, authentic dim sum, specialty beverages and signature desserts, only $15 for adults, $10 for children 12 and under. 100% of proceeds benefit the BSAC summer camp programs for children. Call 813.689.0908 to make your reservations. 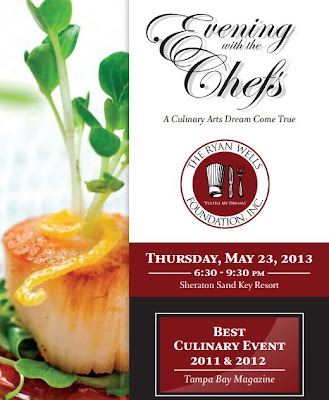 May 23rd - Ryan Wells Foundation 8th annual Evening with the Chefs on Thursday, May 23rd at the Sheraton Sand Key from 6:30 – 9:30pm. Awarded Tampa Bay Magazine’s “Culinary Event of the Year” for 2011 & 2012, Evening with the Chefs features high school students working side-by-side with the Executive Chefs from Café Ponte, Guppy’s, Island Way Grill, Mystic Fish, Parkshore Grill, Sandpearl Resort, Sheraton Sand Key Resort, TradeWinds Resort and William Dean Chocolates. The event is a culinary dream come true featuring gourmet appetizers, entrees and desserts. Last year’s event raised over $100,000 and had 400 guests in attendance. Click here for table and ticket sponsorship information. 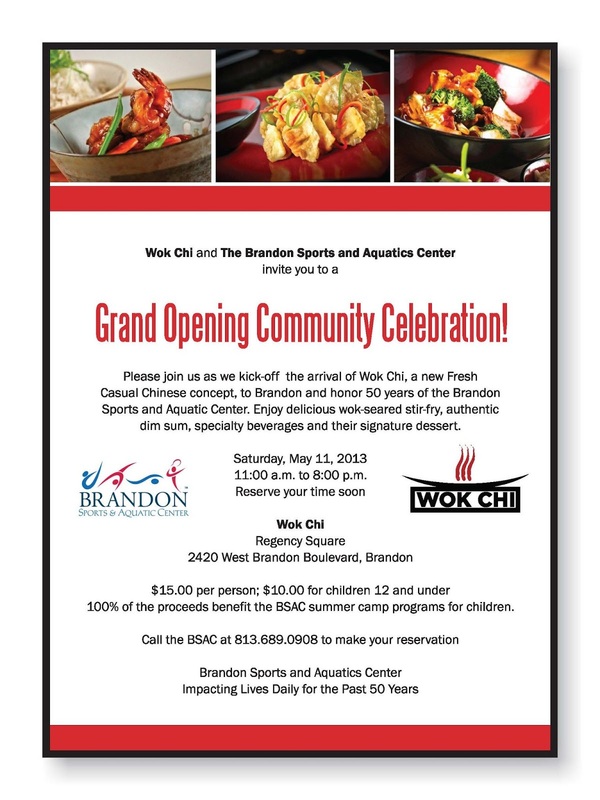 Although I'm pumped for Wok Chi, I have to say...I am SO stoked we are going together to Evening with the Chefs...it is going to be one amazing event :) Awesome write up for these great causes!